Superheroes took flight in Buffalo State’s Community Academic Center for five weeks this summer during the first Elementary Literacy and Arts Summer Camp in partnership with West Buffalo Charter School. 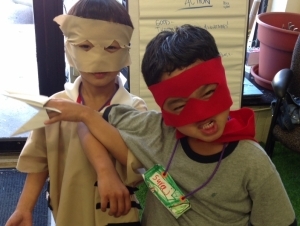 Fourteen children entering kindergarten through fourth grade created and donned superhero costumes, built a playhouse, worked on animation projects, and delivered a performance during the five-week afternoon camp. The camp was attended by children living in the Grant Street neighborhood and was funded through a gift from Eleanore Woods Beals and her husband, Vaughn Beals, West Buffalo Charter School, and the Health Now Healthy Living Fund. Four Buffalo State students and recent alumni—majoring in art education, elementary education and reading, dietetics and nutrition, and creative studies, who were also Aaron Podolefsky AmeriCorps fellows—conducted the lessons, with oversight from Michelle Bae, assistant professor of art education, Zoe Fabian, CAC AmeriCorps VISTA, and Maureen McCarthy, CAC program coordinator. Buffalo State students gained experience working with culturally and linguistically diverse youth. "After this summer, I can honestly say that I feel more secure in my own teaching practices involving urban youth," AmeriCorps member Katie Silverstri said "It was a way to put theory learned in my coursework and teacher training, into practice." Additionally, Buffalo State students had extended time and the ability to interact more closely with youth at the CAC than they would in a traditional classroom setting. The opportunity to have in-depth, small group interactions with children can provide future educators with a more holistic understanding of their students. "Because the groups are smaller, it's easier to manage and assess," said AmeriCorps member Meg Tenney. 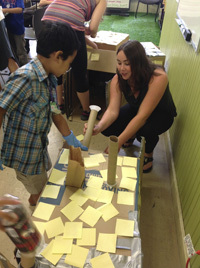 To help support the state’s Common Core commitment, the Buffalo State students included reading and writing in the projects, while still encouraging the children to use their imaginations. "With minimum prompts and oversight, the children are very creative," Bae said. "Their skills are much higher and advanced than we think. When there are not so many boundaries and restrictions put on them, it’s amazing what children can do."